Location: The Ray House [ Waypoint = N37 06.413 W93 23.888 ] is the second stop on the WCNB Auto Tour Loop. Stop in the parking area and walk up to the house. The Ray House is open on weekends (subject to staff and volunteer availability), Memorial Day through Labor Day. Be sure to check at the Visitor Center to find out whether the house is open. Looking northwest from the front porch, you will be able to see the Ray Springhouse [ Waypoint = N37 06.462 W93 24.032 ] off in the distance. 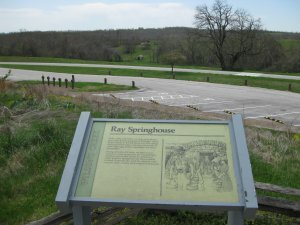 There is a walking trail from the Ray House that you can take down to the springhouse. You will cross the Tour Loop Road along the way. Description: The owner, John Ray, had emigrated from Tennessee to Missouri in the late 1840s and purchased the farm in 1851. At the time of the battle in 1861, John Ray was married to Roxanna Steele and they had eight children. By 1861 the Rays had a prosperous 420-acre farm with a value of $6,000. The Rays farmed many crops, including corn, wheat, oats, Irish potatoes and hay. In addition, Ray kept bees for honey and an orchard with a variety of fruit, and bred and raised horses, cows, sheep and hogs. 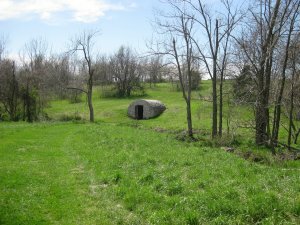 The springhouse in the valley opposite the house was designed to preserve and cool milk, cream and butter, as well as store fruits and vegetables. The spring that flows from the hillside into the springhouse was a source of drinking water for the family and animals. 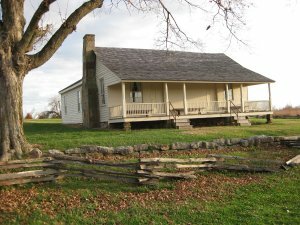 The Ray House is the only surviving dwelling from the time of the battle and the Ray Springhouse is the only other period structure on the battlefield. The Ray House was located on the Wire Road (also known as Telegraph Road) in 1861. 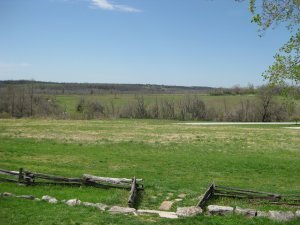 This road ran from Jefferson City, Missouri to Fort Smith, Arkansas and passed through the towns of Springfield, Missouri and Fayetteville, Arkansas. During the battle, John Ray watched from his front porch while his family were sheltered in the safety of the house cellar. 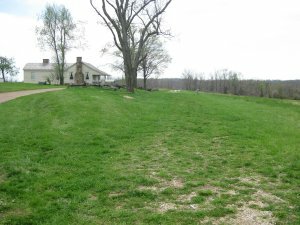 If you look to the northwest past the springhouse, You might be able to visualize what John Ray saw on the morning of August 10, 1861. Just up the hill past the springhouse at the southern end of the Ray Corn Field, the Confederate Second Arkansas Mounted Rifles under the command of Colonel James McIntosh and the Third Louisiana Infantry under the command of Colonel Louis Hebert attacked the Infantry Battalion of US Regulars commanded by Captain Joseph B. Plummer. The Ray House was used as a field hospital, and the Ray family helped take care of the wounded Confederate soldiers. After the battle was over, Union Brigadier General Nathaniel Lyon's body was brought to the Ray House and placed on a bed for examination before being moved to Springfield. 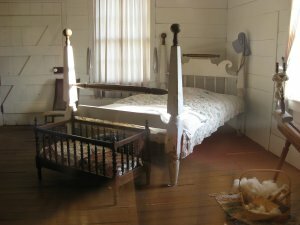 This bed is on display in the Ray House.